Budget Secretary Benjamin Diokno on Wednesday said he was not against the salary increase of public school teachers even after he had earlier said this was not a priority of the government. “I am not opposed to increasing the salaries of our teachers,” Dikono said in a press briefing at the Department of Budget and Management (DBM) Central Office in Manila. “I understand the crucial role teachers have in nation-building and I do believe they should be rewarded accordingly,” he added. The budget chief had earlier said the raise in salary of teachers would take a backseat to more pressing programs of the administration, which include the 8-trillion “Build, Build, Build,” infrastructure projects. His statement came after President Rodrigo Duterte ordered the DBM to find ways to increase the salaries of public schools teachers after increasing those being received by police officers and soldiers. The DBM said that doubling the salaries of teachers would require an additional P343.7 billion in Personnel Services (PS) costs. In the 2018 General Appropriations Act (GAA), DBM said that the programmed PS costs for teaching positions is set at P381.1 billion. Diokno explained his previous statement, saying the pay increase for teachers was not a government priority for now. “We have to ensure that our public sector deficit remains manageable,” he said. “Financing this P343.7 billion may require hiking the deficit from 3% of GDP to 5% of GDP, and it may put at risk the excellent international financial standing the Duterte Administration has built over the past 18 months,” he added. “Alternatively, we may raise more taxes or reduce other expenditure items,” he said. “Consider that Package 1A of TRAIN is expected to deliver about P90 billion in revenues, yet this is only about one-fourth the amount needed to finance the doubling of salaries of teachers,” he added. Presidential Spokesperson Harry Roque had earlier said Duterte wanted the revenues to be generated by the next package of tax reform measure to finance the pay hike for teachers. 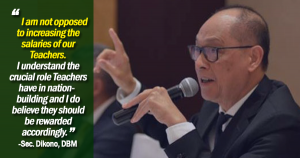 But Diokno cautioned against sacrificing spending for other Budget priorities such Build Build Build, Free College Tuition, Marawi Rehabilitation, the Cash Transfer Programs of the government, among other things. “We must think and prioritize long-term solutions for our country’s development and for the people’s general welfare,” he said. 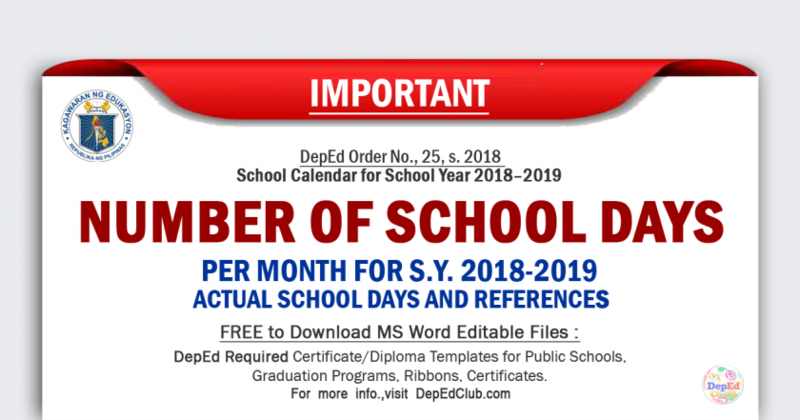 At present, the DBM said an entry-level public school teacher (Teacher 1), having Salary Grade 11 under Tranche 3 of the Salary Standardization Law (SSL), earns a monthly salary of P20,179. DBM added that an entry-level public school teacher will enjoy bonuses and allowances of P74,358 annually. 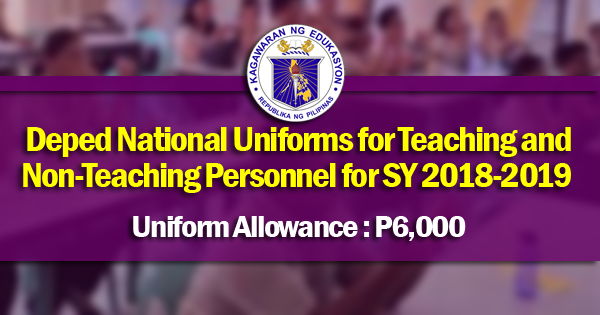 This rounds up the monthly compensation package of teachers to P26,375, it said. By 2019, DBM said their monthly salaries will increase to P20,754 and their total annual bonuses and allowances will increase to P75,508, rounding up their monthly compensation package to P27,046, or P671 more per month.